Each spring, Japan's landscape is host to fragile pink and white sakura blooming; stunning colour that is celebrated throughout the entire country. 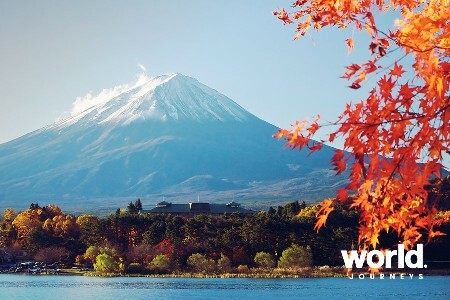 Start this journey in bustling Tokyo and see its impressive gardens, go in search of the famous 'snow monkeys' and the alpine 'old town' of Takayama. On to cultural Kyoto and poignant Hiroshima, ending with spectacular views of Mt Fuji from the top of Mt Owakudani. This unique and incredibly scenic country with enchanting culture, wonderful cuisine and gracious people awaits you. 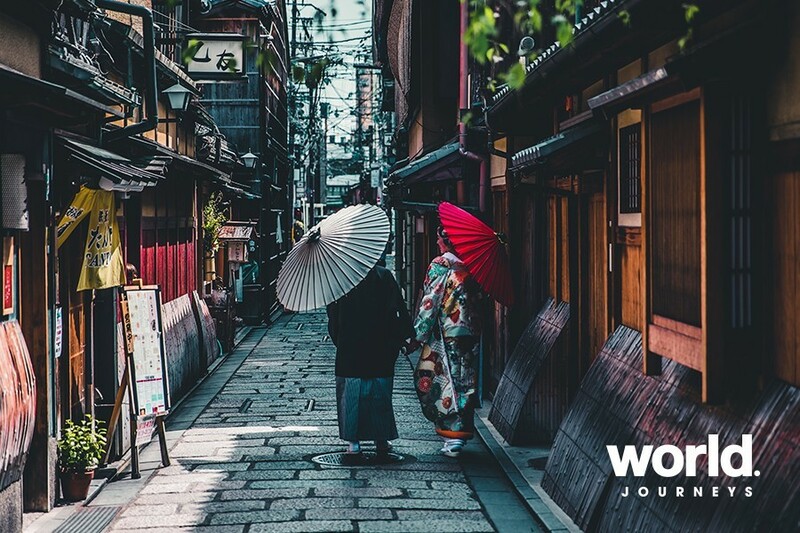 On this journey you will enjoy the following special experiences •Take the ultimate sushi-lovers tour in Tokyo Visit Tsukiji Outer Market to see the world's largest fish market. A sushi master will guide you through making sushi rolls and nigiri which we'll then enjoy for lunch. 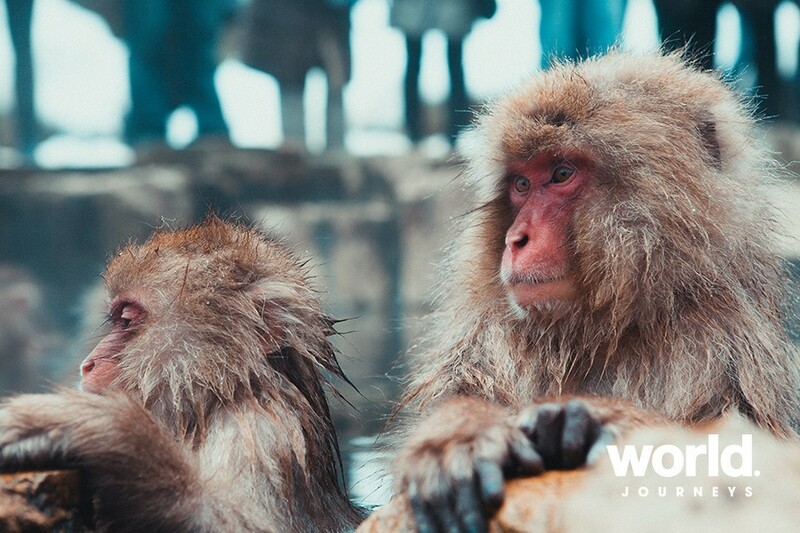 •Visit steaming hot springs to see monkeys bathing Visit Yudanaka Onsen to see wild snow monkeys relaxing in the steaming hot springs surrounded by thick forest. 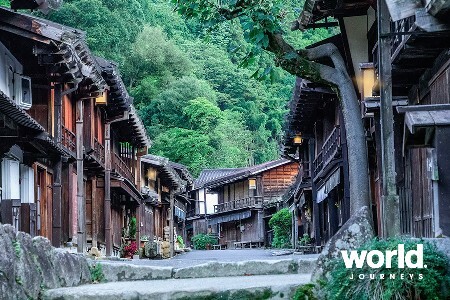 •Tour the historic villages of Shirakawa-go and Gokayama Located in a mountainous region that was cut off from the rest of the world for a long period of time, these villages with their Gassho-style houses subsisted on the cultivation of mulberry trees and the rearing of silkworms. 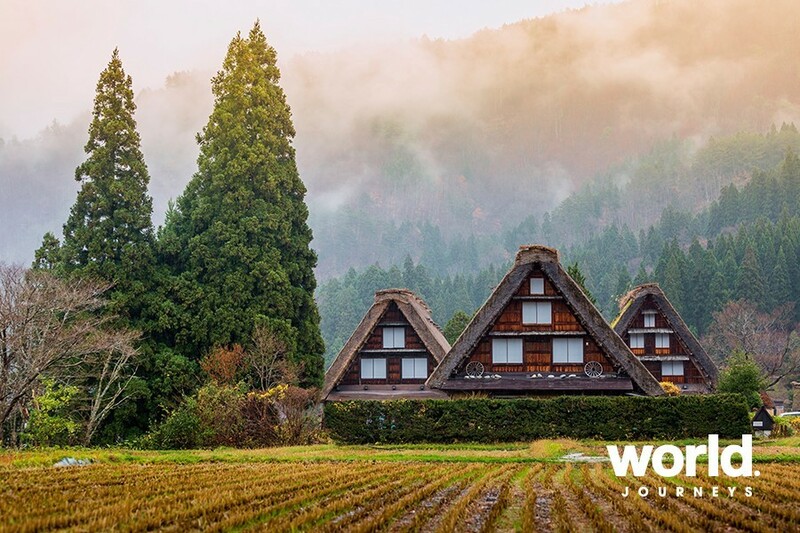 On this tour you'll see the large houses with their steeply pitched thatched roofs, the only examples of their kind in Japan. Welcome Back Offer If you have travelled on one of our Hosted Journeys before, we would like to offer you a saving of $400 per couple (or $200 per person) if you book this journey. Early Booking Offer Book and pay your deposit by 31 July 2019, and save $400 per couple (or $200 per person). This offer may be combined with the Welcome Back offer of an additional $200 saving per person if you have travelled on one of our Hosted Journeys before. Tues 24: Auckland > Tokyo Morning flight to Tokyo. On arrival we will be transferred to the Grand Nikko Tokyo Daiba for an evening at leisure. Wed 25: Tokyo (B,L,D) Full day tour of Tokyo visiting Meiji Shrine, Tokyo's most famous Shinto shrine which is wonderfully serene and austere. Visit Tokyo Tower, Omotesando Street, Asakua Kannon Temple, Akihabara Electronic Town and drive by the famous intersection of Shibuya, the bustling shopping district. Lunch is included at a local restaurant. Enjoy a welcome dinner this evening at your hotel. Thurs 26: Tokyo (B,L) Half day tour of Tokyo where you will visit the Tsukiji Outer Market and learn how to make sushi from a local chef. Visit Ginza Mitsukoshi, the oldest surviving department store. 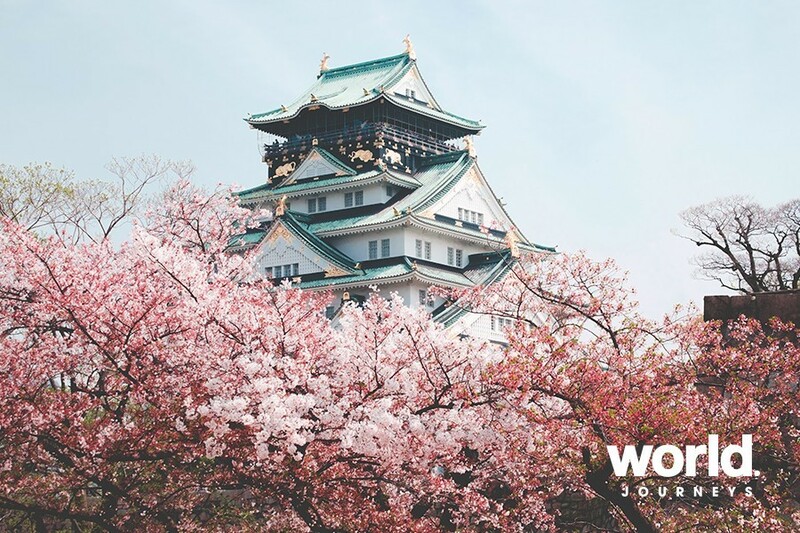 See the Imperial Palace Plaza, Hamarikyu Garden and Ueno Park, a popular spot for cherry blossom parties with more than 1000 cherry trees lining the streets. Afternoon and evening at leisure. Fri 27: Tokyo > Yudanaka (B,L,D) This morning depart for Nagano by bullet train and then travel by train to Yudanaka, the spa town. Here we visit the Jigokudani Monkey Park where we hope to see 'snow monkeys' bathing in the steaming natural onsen pools. Check in to our hotel complete with indoor and outdoor onsens (spas). Sat 28: Yudanaka > Takayama (B,D) Continue to the historical town of Takayama set in the heart of the Japanese Alps. This town is beautifully preserved with many buildings dating from the edo period, when the city thrived as a wealthy town of merchants. They provide a glimpse into the former living quarters of the merchants and exhibit traditional household goods and local arts and crafts. Afternoon visit to the Zenkoji Temple, a wasabi farm and Matsumoto Castle. Sun 29: Takayama > Shirakawago > Gokayama > Kanazawa (B,D) Visit the morning markets and the former government house of Takayama. See the Shirakawago UNESCO World Heritage Listed site, famous for its traditional gassho-zukuri farmhouses, with their steeply pitched thatched roofs, some of which are more than 250 years old. Visit the Japanese Paper Village of Gokayama. Finish in Kanazawa a pristine castle town with an array of cultural attractions. Mon 30: Kanazawa > Kyoto (B,D) Visit Kenrokuen garden, one of Japan's most beautiful gardens. In spring, visitors can see plum and cherry blossoms. We also visit the Samurai House, Gold Museum and Ohmi-cho Market. Then we travel two and a half hours on the train to Kyoto. 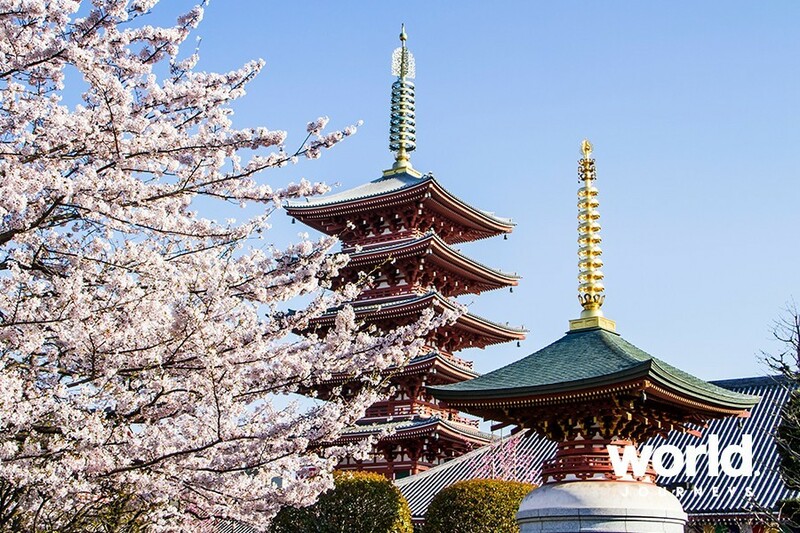 Tues 31: Kyoto (B,L,D) Kyoto is Japan's cultural heart, known for its Buddhist temples, beautiful gardens and colourful shrines. Enjoy a full day tour to see the Kinkakuji Temple and Ryoanji Temple, ending with Kiyomizu Temple, perched on a hill overlooking the Kyoto basin and a UNESCO World Heritage Site. Dinner at a local restaurant. Wed 01: Kyoto (B) Visit Nijo Castle then Arashiyama for a visit to the Sagano Bamboo Grove with thick green bamboo stalks which seem to continue endlessly in every direction. See the 'Moon Crossing Bridge' a central landmark famous for its cherry blossom viewing. Finish with a visit to Tenryuji Temple. Afternoon at leisure. Thurs 02: Kyoto > Nara > Osaka (B) Touring today includes Nara en route to Osaka. Visits include Todaiji Temple, Nara Park, the Kasuga Shrine, with great views from Osaka Castle. Fri 03: Osaka (B,L) Enjoy a half day tour of Osaka including the Kaiyukan Aquarium. See Umeda, the commercial and business district, with its prominent skyscrapers. Enjoy time at leisure. 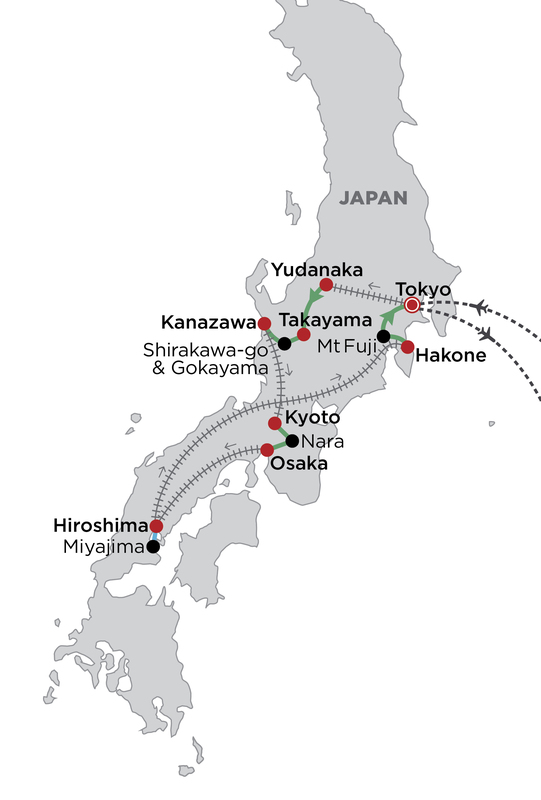 Sat 04: Osaka > Hiroshima (B,L) We drive to Kobe to visit a sake brewery then have lunch at a Teppanyaki restaurant. In the afternoon take the bullet train to Hiroshima. 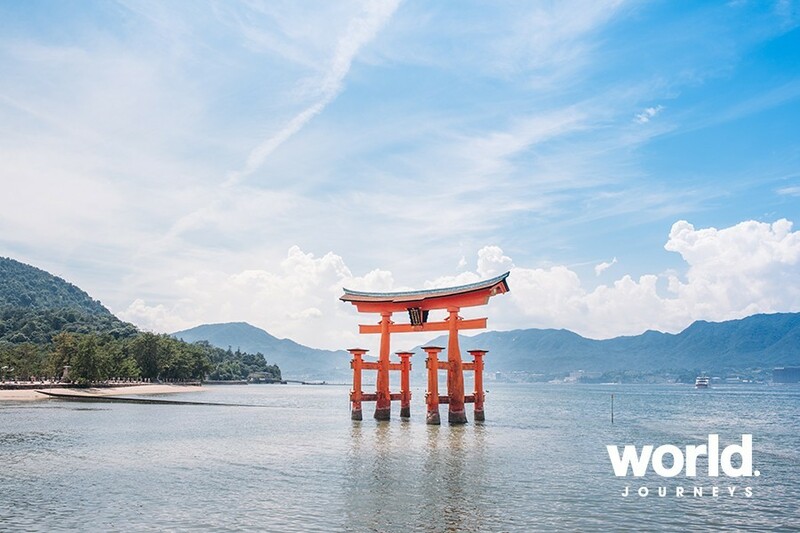 Sun 05: Hiroshima & Miyajima (B,D) Hiroshima has rebuilt itself as one of Japan's most laid back yet vibrant cities full of wide boulevards and art museums, great food and friendly, welcoming people. Visit the Peace Memorial and Museum, A-Bomb Dome and take a short ferry ride out to Miyajima Island, a small wooded island located in the Inland Sea. Here you will find the famous, floating Torii Gate, a shrine known worldwide for being built over water, seemingly floating in the sea. Mon 06: Hiroshima > Hakone (B,D) Take the bullet train to Hakone. Visits the Ichiku Kubota Museum and scenic Lake Kawaguchi before transferring to our hotel. Tues 07: Hakone > Tokyo (B,L,D) Ride the cable car up Mt Owakudani, passing over sulphurous vents and hot springs. In this volcanic area, you can eat a hard-boiled egg from the sulphuric hot springs, adding seven years to your life! 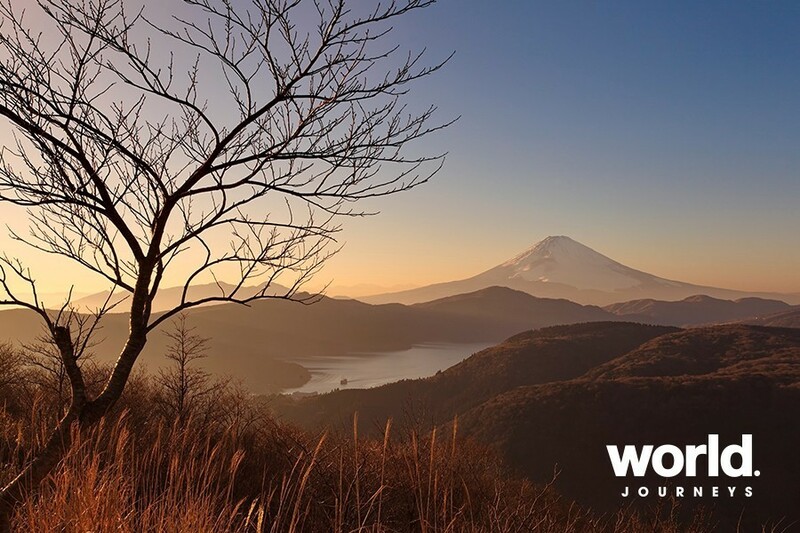 From the top, if it's a clear day, we will see stunning views of Mt Fuji, Japan's highest and most worshipped mountain, and Lake Ashi. We end with a cruise on Lake Ashi then continue by road to Tokyo where we enjoy our farewell dinner. Wed 08: Tokyo > Auckland (B) Morning at leisure. Afternoon transfer to the airport for our overnight flight to Auckland. A non-refundable deposit of $1,500 per person is required, with the balance due 22 January 2020. As cancellation fees apply, travel insurance is mandatory. Please refer to World Journeys terms and conditions. Note: Due to the lack of porters in Japanese railway stations and the unavailability of storage on Japanese trains your luggage will travel separately from you on days that involve train travel. From Kyoto your luggage will travel directly to Tokyo so you will travel with a small overnight bag for 3 nights. The separate transfer of luggage within Japan is done by courier and is in the interest of your safety and comfort on the tour. Book and pay your deposit by 31 July 2019, and save $400 per couple (or $200 per person). This offer may be combined with the Welcome Back offer of an additional $200 saving per person if you have travelled on one of our Hosted Journeys before.